Search and adopt a Plott Hound near you. The Plott Hound breed originated in the mountains of North Carolina around 1750 and is the only breed known to have originated in this State. Named for Jonathan Plott who developed the breed as a wild boar hound, the Plott Hound is a legendary hunting dog known as a courageous fighter and tenacious tracker. He is also a gentle and extremely loyal companion to hunters of North Carolina. The Plott Hound is very quick of foot with superior treeing instincts and has always been a favorite of big-game hunters. 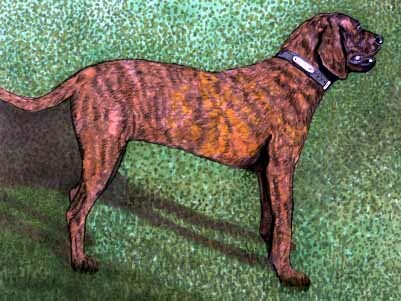 The Plott Hound has a beautiful brindle-colored coat and a spine-tingling, bugle-like call. It is also only one of four breeds known to be of American origin.